Starting with a common sport that millions of people around the world in participate in both competitively and for leisure. This non traditional advertising was used in China to promote the Tennis Masters Cup in 2006. The racket was actually a trampoline with a man, dressed in neon yellow, bouncing up and down. The "tennis racket " trampoline is "serving" the bouncing up and down man. 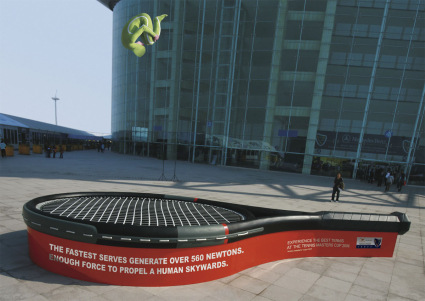 The "Tennis trampoline" reads "The fastest server generates over 560 Newtons. Enough force to propel a human skywards. Experience the best tennis at the Tennis Masters Cup 2006. " 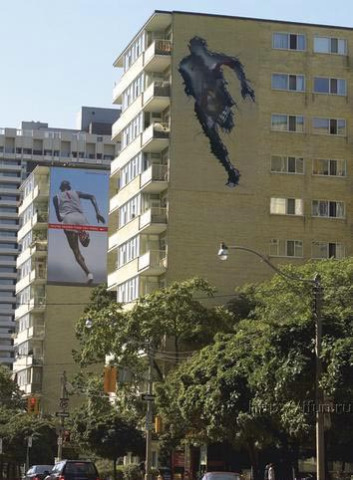 This Nike ad, part of the You're Faster Than You Think campaign, displays a large cut out of Canadian hurdler Perdita Felicien hurdling over the actual billboard. 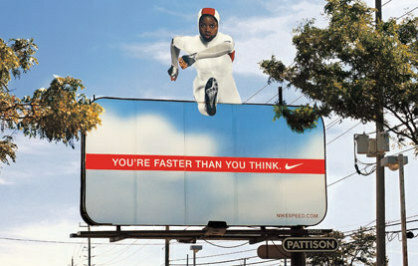 Also in Canada, making his way through this bus stop is distance runner Bernard Lagat in this Nike ad. 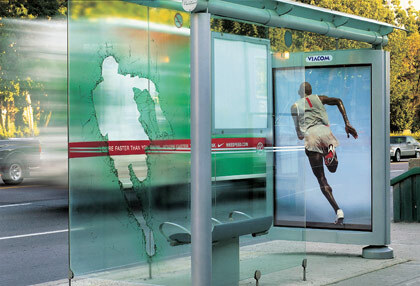 For this series of ads, Nike used simple window stickers to make it appear as though Lagat was literally hauling through the bus stops. Same campaign, same runner, overall same idea, but thru buildings. A sport loved globally, soccer (or football in some parts of the world) also uses alternative advertising mediums to promote the sport. 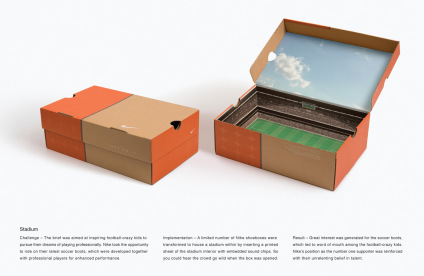 Nike wrapped actual soccer cleat boxes to look like a soccer stadium. Never under estimate the power of advertising in the urinal. 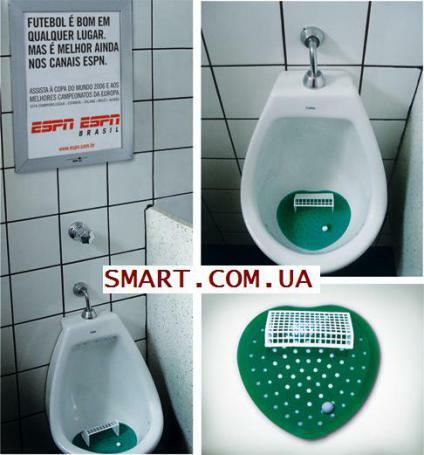 This ad for ESPN gave those oh so talented men a chance to "play" while promoting ESPN Brazil in the bathroom at local bars and restaurants. Even nontraditional sports have made their way into advertising. Moving on from the advertising of tennis, running and soccer and switching to very nontraditional sports (but none the less, still athletic hobby) jump roping, dancing and weightlifting. 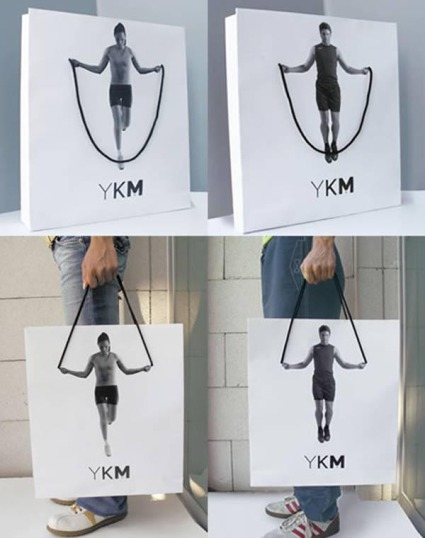 What do you think of this bag advertising? Over the last few years we have seen much use of bag advertising, but very few that use the string handles as part of the ad, let alone the main focus. 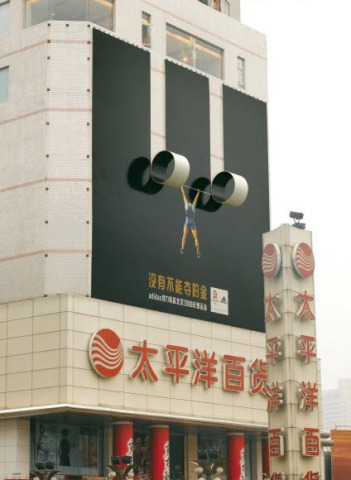 This 3D Chinese billboard shows a man hanging from what appears to be a very heavy weight lifting challenge. 7. Dance - Who said dancing wasn't a sport? People around the world take dance classes to lose weight, get in shape and even compete. 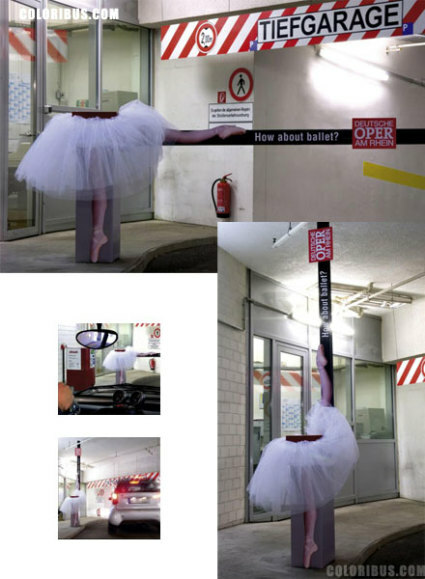 This following advertising was used in parking garages throughout Germany to promote upcoming dance classes. There is also advertising for sports who have recently gained worldwide popularity including tennis and cycling. 8. Cycling - Love your bike. This outdoor campaign was seen around the United Kingdom in order to promote cycling as exercise and hobby and directed you to loveyourbike.com for more info. 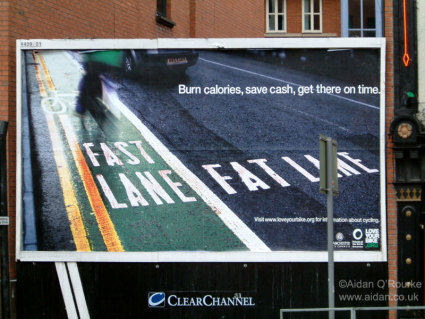 Besides the main purposes, mentioned above, there were other purposes for the ads as the Fast Lane/Fat Lane campaign copy reads:Burn calories, save cash, get there on time. Even those with nothing to do with sports use sports to promote their product/organization/idea. 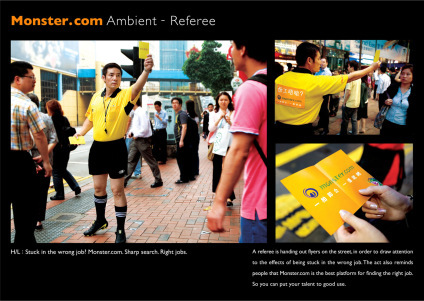 This advertising "referee," for example, is advertising Monster.com job site and the idea of looking for a new job. The "Tired of Your Job?" campaign from Monster.com placed people dressed as those who don't always have desirable jobs on street corners to pass out advertising for Monster.com. I have found sports related ads for tennis, weight lifting, soccer, even jumping rope and job searches. What other ones do you know of? Do you like any of them? Which is your most favorite and least favorite? I like the guy breaking through the walls of the building best.Cool ads Amy. I wonder how long trampoline man's shift lasts! Great ads! Running through the building and the bag handles are the best!